Redland City Mayor Karen Williams keeps the Golden Gnome just of reach of one the first teams registered for Redlands Amazing Race. [from right to left] Wellington Point sisters Jaylana and Taafili Taoso will be joined by their cousins from Thornlands, Teagan and Amy Corrie. At 18 years old, Teagan will be both responsible adult and team driver. 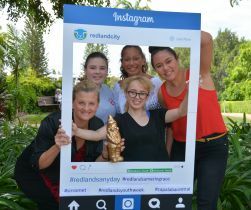 Celebrate the start of Redlands Youth Week (8-14 April) by taking part in the Redlands Amazing Race, organised by Redland City Council and supported by Sirromet and Capalaba Central Shopping Centre. 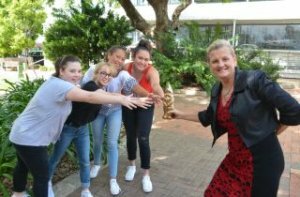 Redland City Mayor Karen Williams said that residents should race to Council’s website now to register for this free fun youth-focused event set for 8 April, the middle Sunday of the school holidays. “Although this event celebrates Youth Week, all those who are young at heart are bound to enjoy it, with rock climbing, laser tag and much more on offer across many beautiful Redlands locations. “Teams of family and friends are challenged to a giant treasure hunt – just follow the clues around mainland Redlands in search of the elusive Golden Gnome,” Cr Williams said. “Up for grabs are ten prizes valued at $50 for the stage winners, and an overall prize valued at $360 for the winning team. For full terms and conditions and to register, please visit redland.qld.gov.au and search for Redlands Amazing Race.